Chocolate Pear home office with drawers, library and custom desktop. 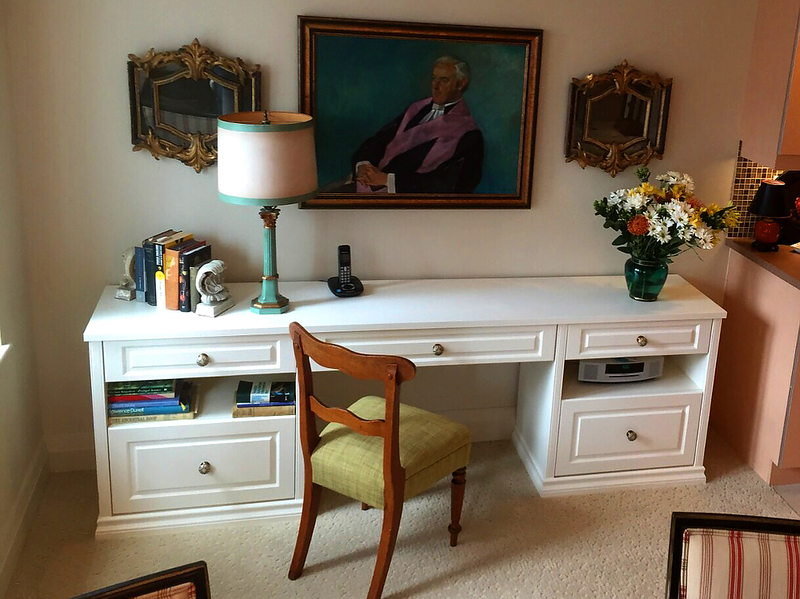 Shaker style home office in Antique Whitewash with L-shaped laminate desktop. 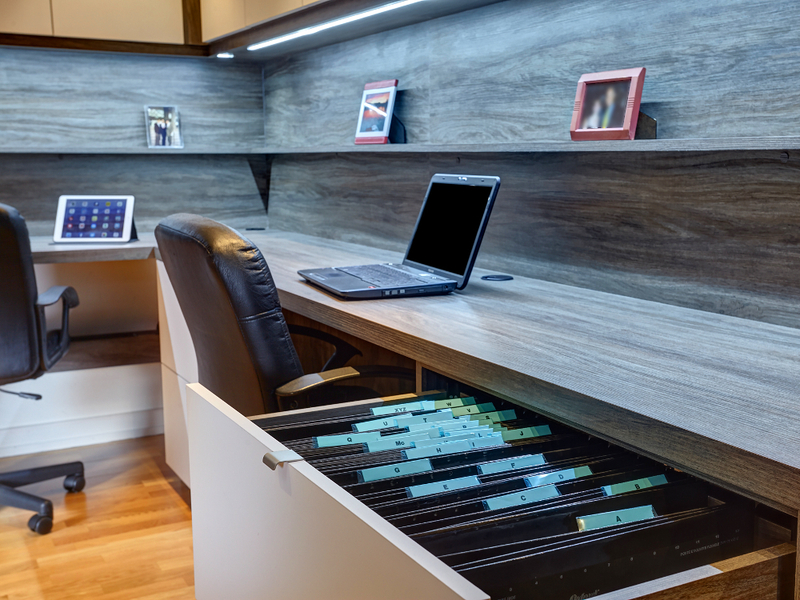 Sand Molina Ash melamine home office in guest room with Murphy Bed, LED lighting and super mat white accents. Factory painted cabinetry in boy's room, including wardrobe, display shelf and glass desktop. Traditional stained wood home office with crown, flutes and woven metal mesh inserts. 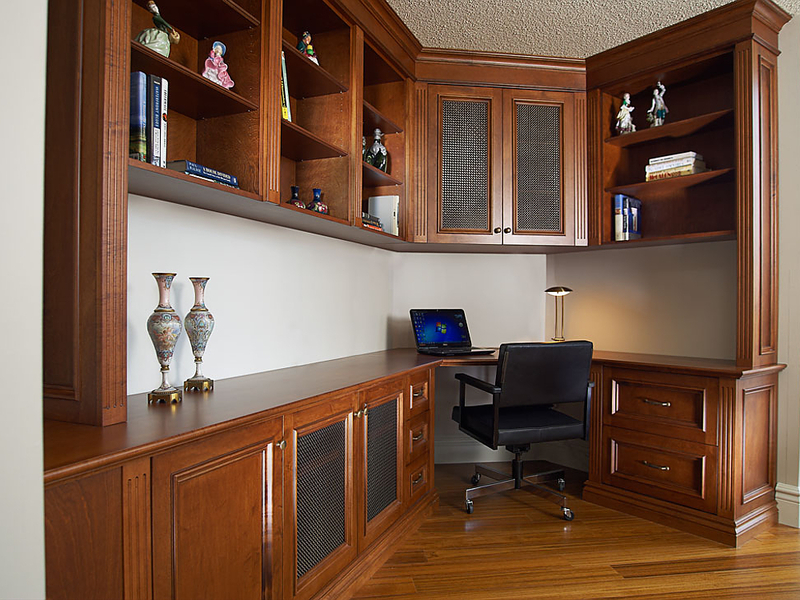 High gloss antracita home office with wardrobe space, LED lights, stainless desktop and woodgrain accents. Traditional factory painted desk with decorative hardware. 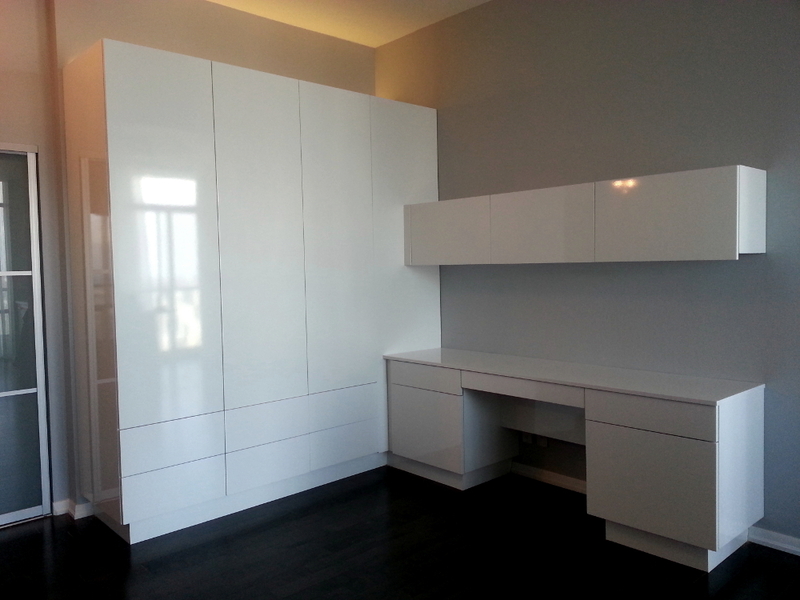 High gloss white condo wardrobe with push to open frontage and adjacent desk. Desk with upper cabinet storage in Aria melamine with laminate desk top in Daybreak melamine. 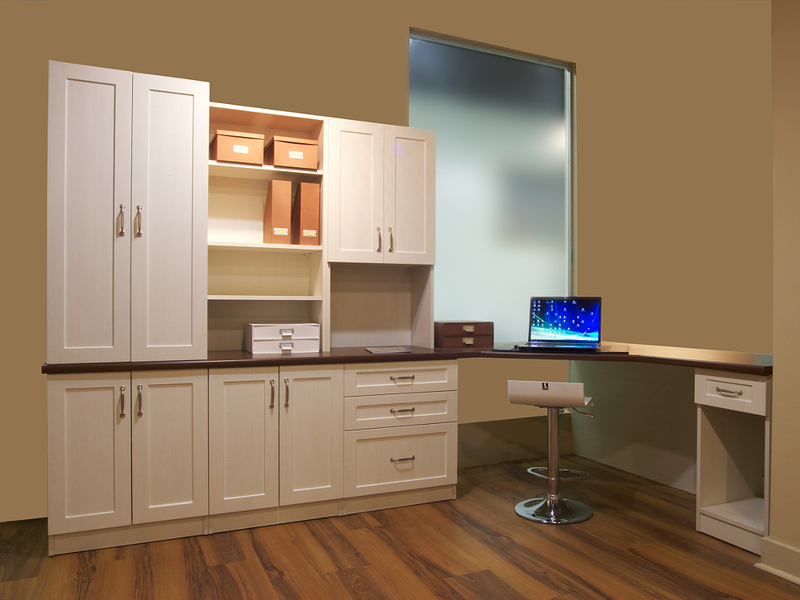 High gloss white is perfect for modern work stations, and can be offset with woodgrain laminates for a stunning look. Complete your work station with file storage for legal size or letter size files. Chocolate Pear work station with white fronts and printer stand. 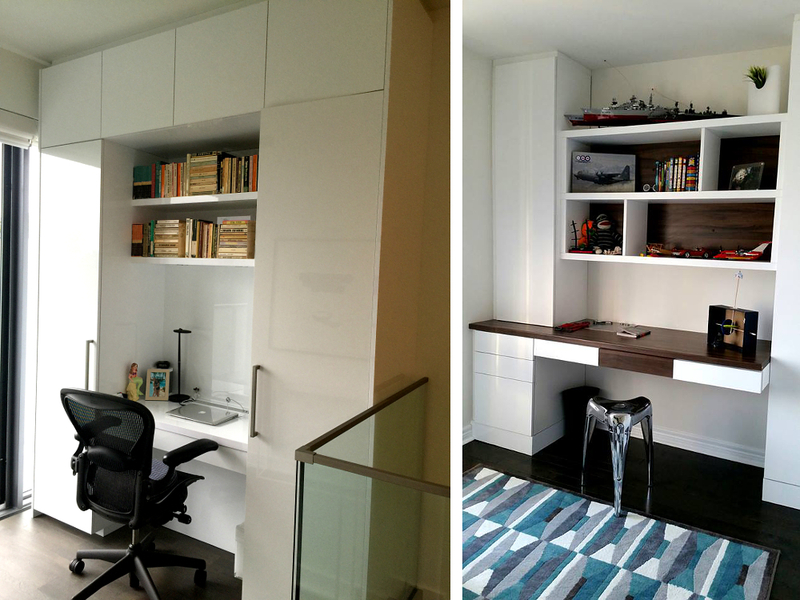 Space Solutions designs complete custom work stations for home office spaces in homes throughout Toronto and beyond. 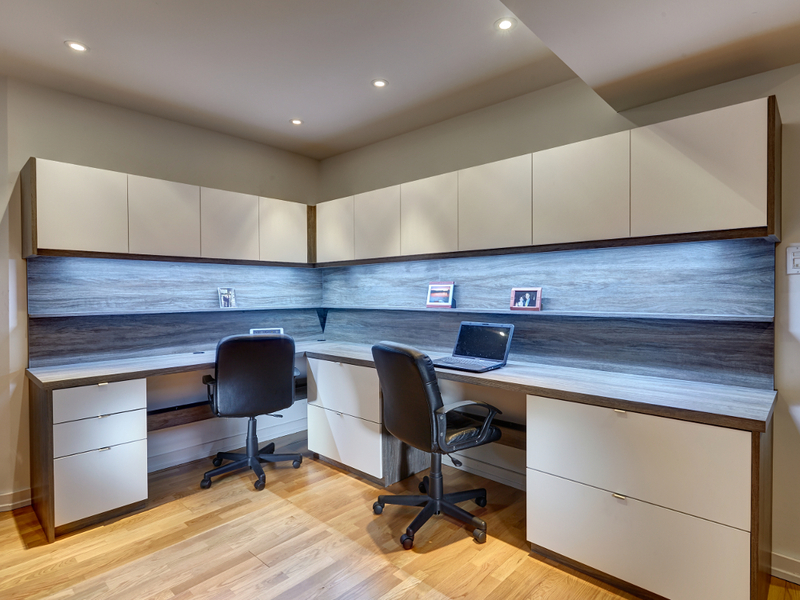 An efficient home office features brightly lit desk space with room to work and organize. Whether you are operating a business from your home, need space for your children to do homework or a space from which to run your household, Space Solutions has a custom work station solution for you. 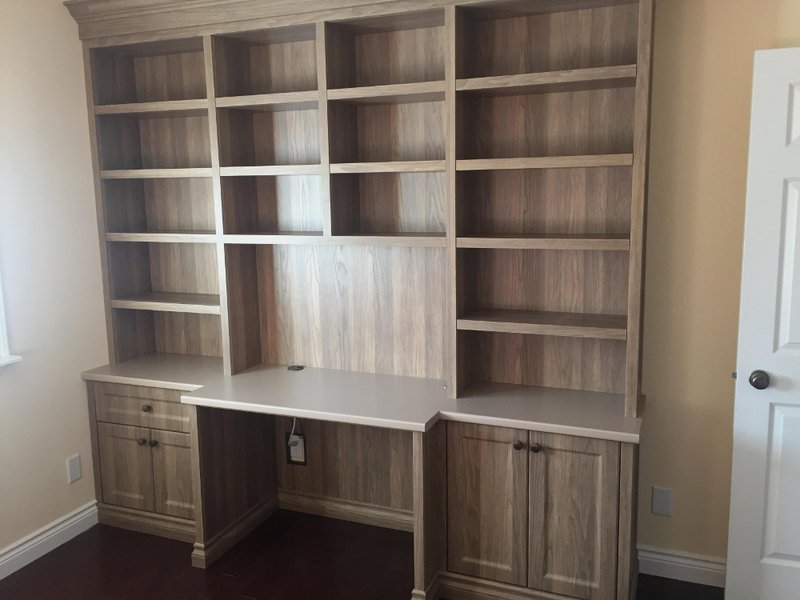 With custom design we can specify all the details for your home office, whether you work from home or simply need to organize your life. Set your desk surface at a height that works for you, and create accessible essential storage for files and supplies. Add space for computer monitors, printers and other office equipment, and Space Solutions will make sure you have access to wires and sockets so your devices are always in arm’s reach. 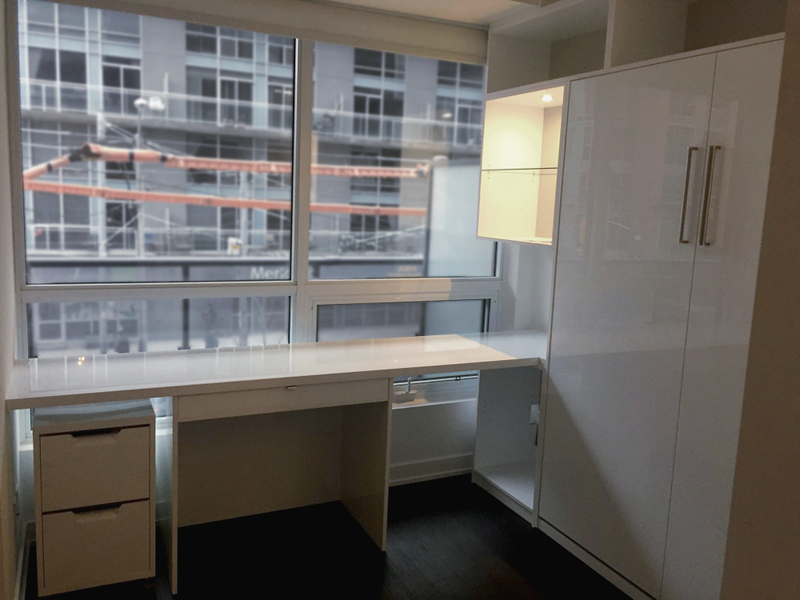 Common upgrades for work stations include locks and energy-efficient LED lighting, and with an incredible range of durable work surfaces and finishes your custom office furniture will serve a variety of needs for years to come. 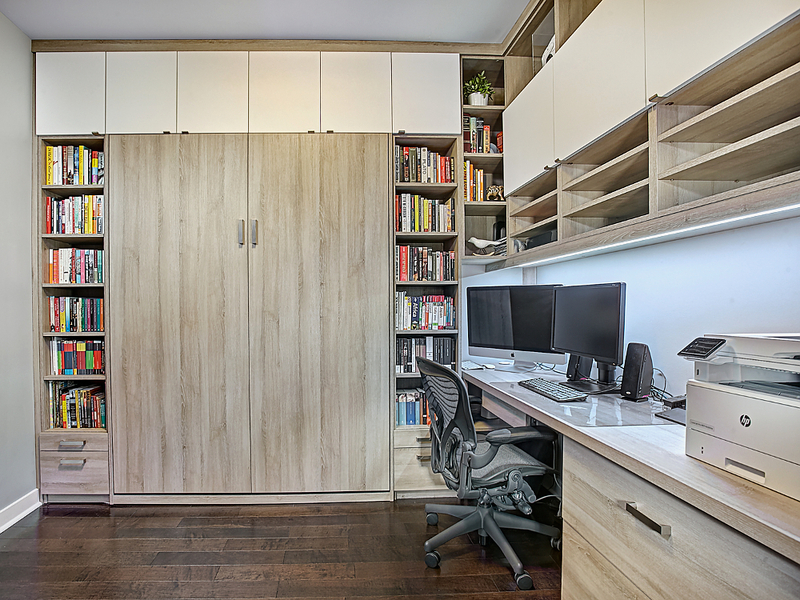 Need more than merely a work station in your custom home office? Turn your space into a combined family room with space for an entertainment center, or a home library. Need space for guests? 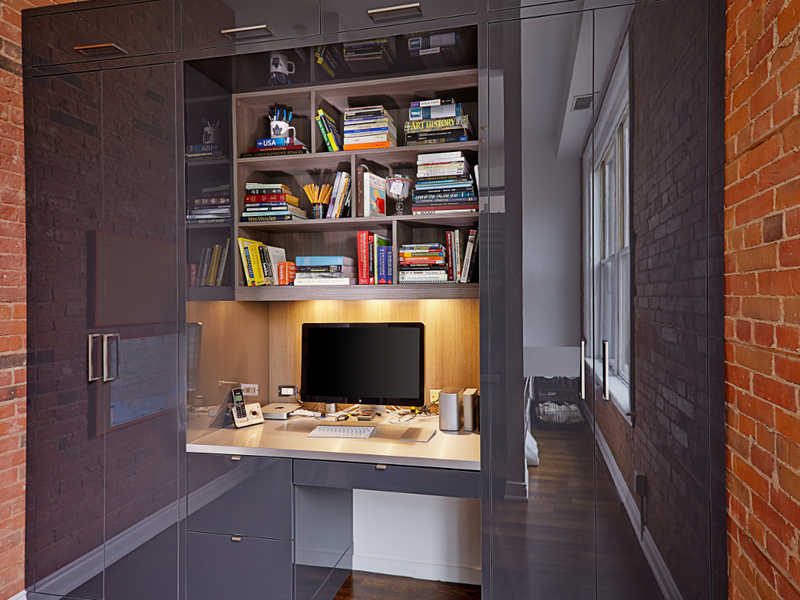 Many home offices will feature a custom Murphy Bed. When friends and family come to visit, you have a comfortable welcoming space for them to stay. Our custom work spaces also create useful work areas in bedrooms and alcoves throughout your home, wherever you need to work. 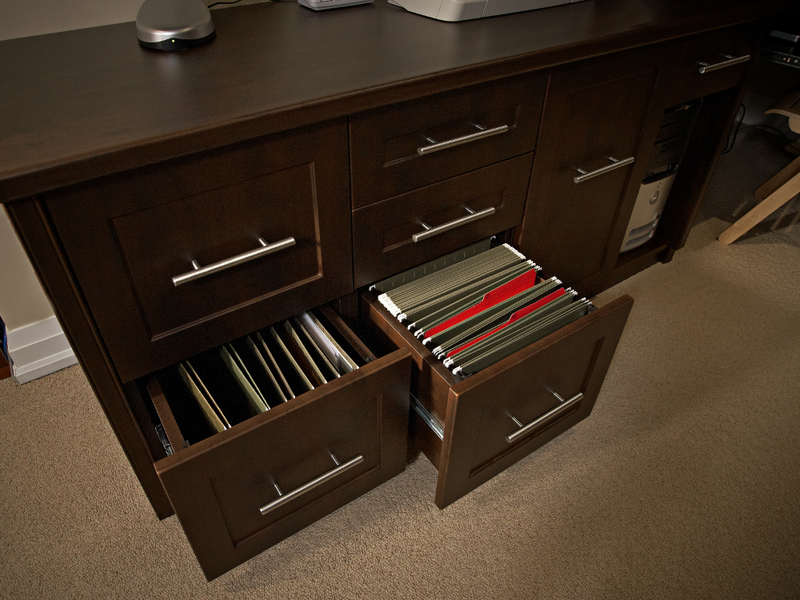 Task lighting, file drawers and pullout desks can be added to closets and family room built-in cabinets too. 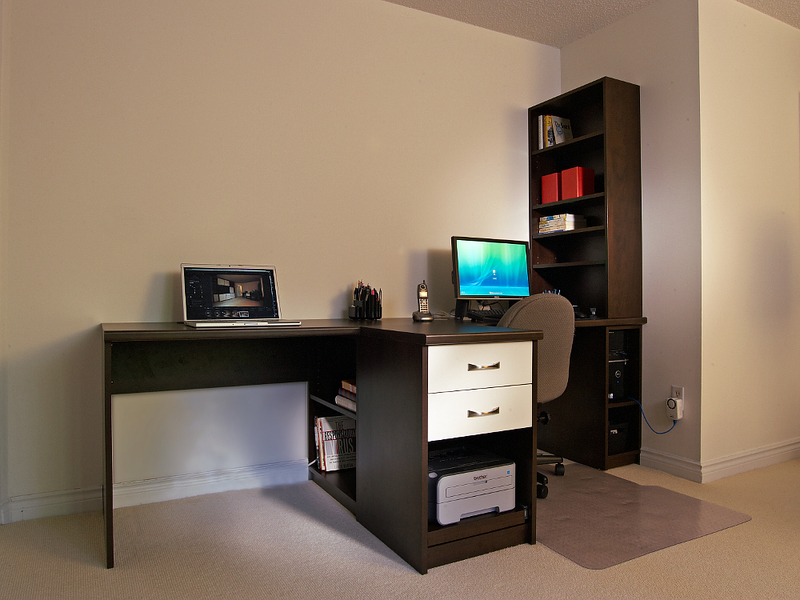 So if you don’t have a separate room for your home office, that’s okay too, and Space Solutions can help you get the most out of your space.